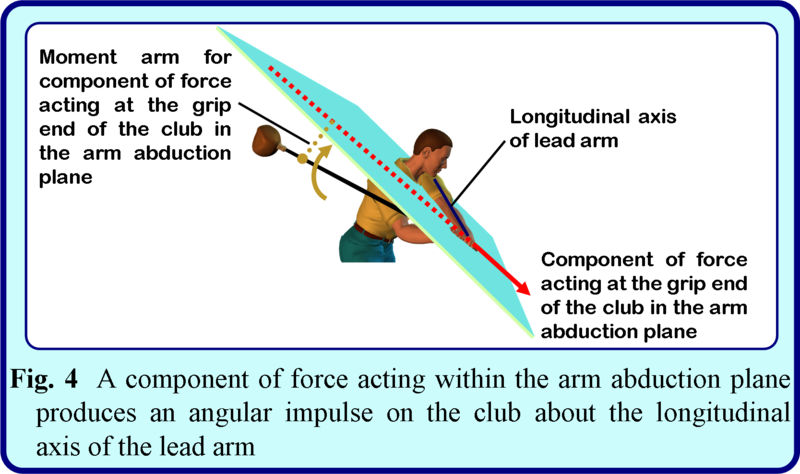 A 3D, 4-segment (torso, upper arm, forearm, and club) forward dynamics model of a golfer was developed to investigate the importance of the positioning of the club relative to the swing plane formed by the motion of the lead arm. By manipulating the initial amount of forearm rotation, the affect of starting the downswing with the club ‘above’ and ‘below’ the swing plane was evaluated. Starting the club below the swing plane generated positive angular momentum about the longitudinal axis of lead arm resulting in the club face completely squaring at impact. Starting the club above the swing plane generated negative angular momentum resulting in the clubface remaining significantly open to the target line at impact. Minor deviations (< 5 cm) of the club from the swing plane can significantly affect the longitudinal rotation of the club, and thus a golfer’s ability to square the clubface. The results also suggest that the club can rotate through 90º about the longitudinal axis of the forearm in order to square the clubface for impact without a muscular torque producing supination. In this optimized simulation, the model has no muscular torque acting about the forearm. Starting the down swing with the club above the swing plane formed by the lead arm prevents the clubface from squaring for impact. In this optimized simulation, the model has no muscular torque acting about the forearm. Starting the down swing with the club below the swing plane formed by the lead arm facilitates squaring the clubface for impact. The mechanism behind this non-intuitive phenomena is shown in the figure below.